WHEN Pierre and Ruth Fakhry stayed for two nights at Hillview Farmstay it was a case of love-at-first-sight. For a couple of years the Sydne had been keen to buy a piece of land within an easy weekend’s drive from the NSW capital. As fortune would have it, the previous owners of the farm-stay were having their first open-house on the same weekend that the Fakhry’s were visiting. “We pooled our resources, made them an offer and the rest is history,” Mrs Fakhry said. There is an added element of interest for Catholics with the property being home to a small wooden shrine bearing the title ‘Our Lady Queen of Families’. Mr Fakhry, a qualified carpenter originally from Lebanon built the shrine, whilst last year it was blessed on the Feast of the Immaculate Conception by Fr Luke Joseph, the parish priest of Tarcutta. Fr Joseph is also of Lebanese descent. ‘Hillview’ is located at the base of Mount Adrah on the boundary of the Archdiocese. It is interesting to note that in Lebanon ‘Adrah’ means virgin and is one of the names which they use to address Mother Mary. Mrs Fakhry says she and her husband saw this as a deal clincher in purchasing the property and the first thing that they promised themselves was that they would build a shrine to Our Lady. Canberra’s Daniel de Valentin and Wagga Wagga’s Emily Shaw painted the images which adorn the shrine. “We want the farm-stay to be a home away from home with a strong emphasis on family and hospitality,” Mrs Fakhry said. 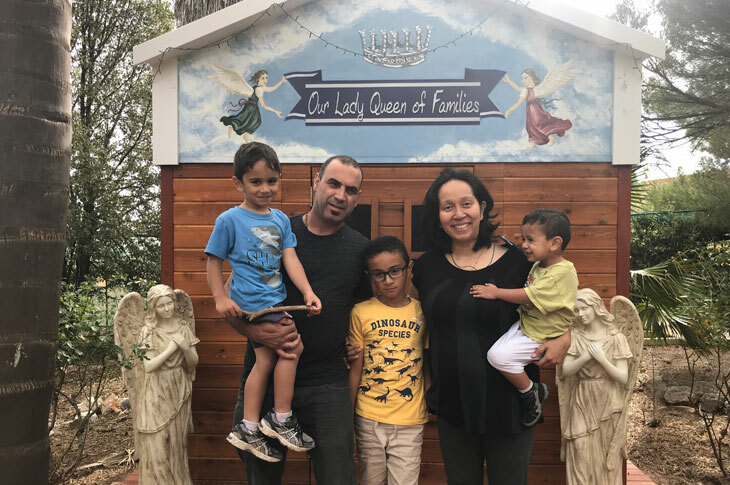 “We thought it was important to have the protection or Our Lady, to dedicate our apostolate to her; and to offer families a nice quiet place to pray. The Fakhry’s are expecting another addition to their family towards the end of June. There are so many families in desperate need. They require your protection. They need your guidance – Mary, Queen of Families, we implore you! There are so many families who have become lax in their faith and even entangled in error. They need your clarity and security. They need your courage and strong faith – Mary, Queen of Families, we implore you! There are so many families who have become too weak in order to resist temptations. They need your strength. They need your purity – Mary, Queen of Families, we implore you! There are so many families who experience difficulties in educating their children. They need your motherly love. They need your educative hand – Mary, Queen of Families, we implore you! There are so many families torn apart through a loss of true love. They need your goodness. They need your understanding – Mary, Queen of Families, we implore you!